TUESDAY TO SUNDAY DINNER CRUISE: From £78.00 pp. A high class Dinner Cruise on which to entertain or be entertained. The French owners have taken a Parisien boat, shipped her across to the Thames and now offer an event aboard the 'Symphony II' that more than justifies the ticket price. This air-conditioned luxury cruiser features clear glass windows, a plush wood interior with silk panels and the latest lighting and sound systems. Be welcomed with a complimentary cocktail . As you would expect from a French operation the 4-course Table d'Hote meal is of gourmet standard with discreet and attentive service. Groups of 21+ need to choose a banqueting menu in advance for their party. Alternatively, an a la carte supplement of £5 pp can be paid in return of having the option to select from the menu on the night. Drinks inclusive: Add £21 per head to have included a half bottle of house red and white wine and mineral water . Each cruise has its own Dance Band and singer with a spacious dance floor. The Menu does change seasonally but on request we can fax/send you a sample. Wines are relatively inexpensive. Timing is 7.30p.m. for 8.00p.m. departure, returning by 10.45p.m. from the Embankment Pier, opposite the tube station. 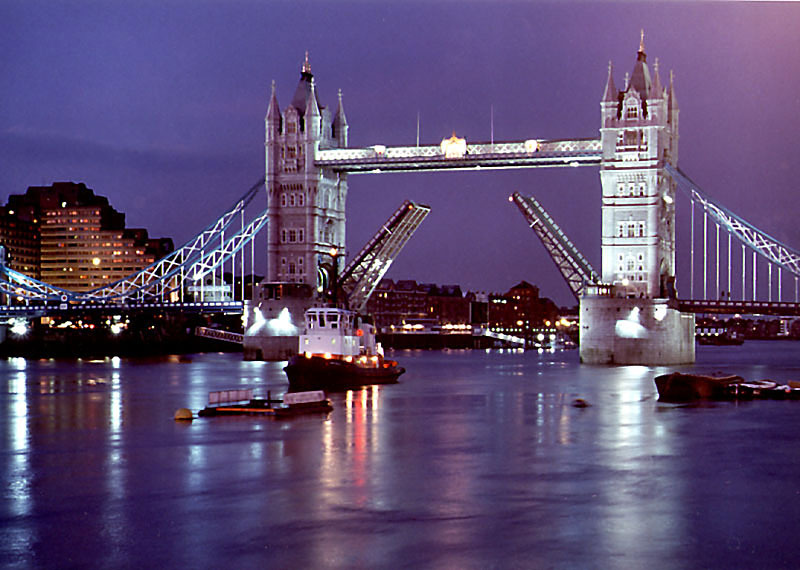 The cruise takes in all the illuminated sights of Central London and beyond. For groups of 50-80 we have an exclusively private area available for hire. Classic Dinner Cruise �78.00 per person Includes: Welcome Cocktail, Four-Course a la Carte Menu & Live Entertainment. 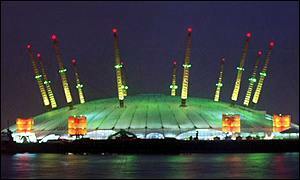 Under 16's not permitted and it's a smart dress code - no denim. Premier Classic Cruise �99.00 per person Includes: Welcome Cocktail, Four-Course A la Carte Menu & Live Entertainment. Plus half bottle of red wine, half bottle of white wine and mineral water. Elite Dinner Cruise �125.00 per person Includes:Upgraded service, exclusive seating at the front of the boat, Champagne Welcome drink, Five-Course A la Carte Menu, a bottle of wine from the wine list and a liqueur. 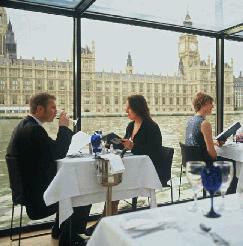 The lunch cruises offered by Thames Boat Cruises are a great way to escape from the hustle and bustle of London life. The carefully considered and modestly priced Thames river lunch cruises are ideal for both business lunches or those wishing to relax with friends and family. Overseen by the Executive Chef, all food on the Thames river lunch cruises are prepared and freshly cooked on board. 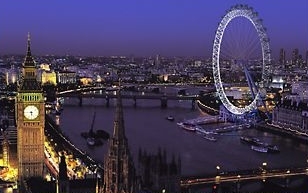 Relax and enjoy the spectacular views as the Thames lunch cruises take you past some of London's magnificent attractions: London Eye, Tate Modern, Shakespeare's Globe, Tower of London and Tower Bridge. With its main base at Embankment Pier, the Thames river lunch cruises offer pick up from and drop-off at both Embankment and Waterloo Piers for the convenience of diners. WEDNESDAY TO SATURDAY LUNCHEON CRUISE: £32.00pp. Timing: 12.30p.m. for a 1.00p.m. departure, back at 2.30p.m. 3-course set menu, tea/coffee and commentary on all the Central London sights. Other days possible but are subject to demand! Children's menu available (5-11yrs). Upgrade to £43.00 pp and receive 1/2 a bottle of wine and mineral water and window table seating. NB Saturdays are extremely popular and particurly in the summer months, it's advisable to bok at least 4-6 weeks in advance. 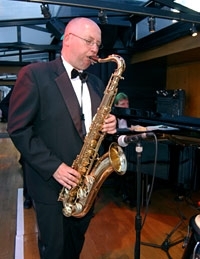 SUNDAY LUNCHEON JAZZ CRUISE: £48.00 pp. Highly popular. Timing 12.30p.m for 1.30p.m. departure, back at 3.30p.m. Splendid set 3-course menu. Cool sounds from the live Jazz Band. You can upgrade to include 1/2 a bottle of wine and mineral water and guranteed window seating for £62.00 pp! Children's menu available (5-11yrs). NB On popular dates, the sister boat, the MV Naticia may also be in operation. A more traditional looking vessel but still oozes class. With large windows, 2 levels, polished dance floor and a newly refurbished glass ceiling, you won't be disappointed. We will notify you at time of booking which boat you've been allocated. The timings for the MV Naticia are 45 mins earlier than the above specified times. Discover the magic of the city at the most picturesque time of the day on board the Naticia, enjoying sandwiches, pastries and scones, as well as an assortment of teas and musical delights. Treat your friends, family or colleagues to London's sights whilst enjoying live music from a solo pianist and a carefully planned menu. Sip on a cup of Darjeeling tea as you enjoy a coffee creme eclair and take in the magnificence that is the London skyline. All pastries and sandwiches are prepared on board ensuring you are served the freshest and most delicious treats.